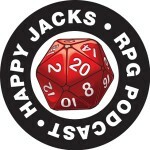 If you enjoy Happy Jacks, consider supporting us through our Patreon. Donations are on a per-episode basis of our normal, weekly show. We’re working on all kinds of rewards to provide to supporters. We’ll announce more soon. Show Notes! We’re going to discuss ways to assess players’ solutions (to problems presented by the GM). Levi writes in with a followup about our unhelpful advice. Of the Hill People sends an update on his in-store Savage Worlds game and muses on language prompts in games. Charles from Ontario asks Why dice roll when you could decision make you don’t want to roll? And Kevin writes in about how RPGs saved his life. The Wright County Geekls of Buffalo Minnesota are having an all-day gaming and geeking extravaganza on New Years Day. Details at: www.wrightcountygeeks.org.